As promised, here is the recipe for my next sour beer. 0.75 oz Whole Czech Saaz 6.4% AA @ 100 min. 0.50 oz. Whole Crystal 4.6% AA @ 100 min. 0.25 oz. Whole Mt. Hood 2.7% AA @ 100 min. 0.25 oz. Whole Cascade 4.3% AA @ 100 min. Toasted oak chair legs, half used half fresh. Loosely based on Beatification from Russian River, a Belgian Pale/Single (Redemption) aged and inoculated with wood previously used in a Flanders Red (La Folie). Hops were about a year old so I adjusted their IBUs down accordingly. Used spring water and added 1 tsp of calcium carbonate to the mash. Adjusted 4 gallons of sparge water to a (cool) pH of 5.5 with 1.5 tsp of phosphoric acid. This was my first time adding acid and measuring pH, the hot break certainly seemed more intense than normal. Collected 6.5 gallons of 1.048 runnings. Boiled down to 4 gallons of 1.065 wort. I forgot how much faster wort evaporation is when you are boiling outside on a propane burner. Cooled the wort then pitched a smackpack of yeast (no time for a starter). Fermented in the mid-60's with a brief period colder when I forgot to turn off the fridge (I was trying to manually control the fridge), fermentation seemed to carry on sluggishly after that. 8/18/07 Transferred to secondary with a 4 inch piece of oak chair leg saved from my Flanders Red that had been soaking in some Flanders Red and the dregs from a bottle of RR Depuration for a week. I then topped up with bottled water in a 5 gallon Better Bottle, and affixed a fresh chair-leg/stopper/airlock assembly. Planning on letting this one age for 1-2 years depending on how it tastes. 12/23/08 Nice krausen formed, decent Brett flavor, not much sourness. 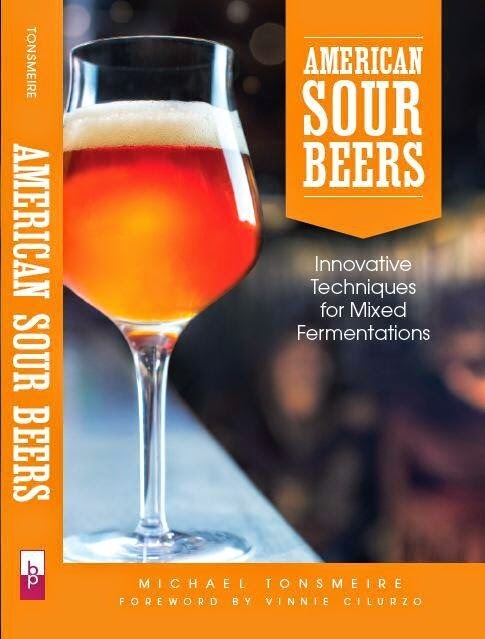 "We add about anywhere from ½ a pound to one pound per gallon of beer, we are always experimenting. We’ve used a Pluot that is 50/50 mix of apricot and plum and one that was 60% apricot and 40% plum. The more the apricot the more tart the beer will be. 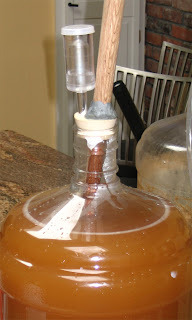 The beer sits in the barrel on the fruit for 9-12 months." 8/11/08 Bottled half of the batch with 3/4 cup of cane sugar (aiming for high carbonation) along with 1/4 pack of cote de blanc wine yeast to speed carbonation. Racked the other half onto 2 lbs of quartered and pitted pluots, pictures/details. The fruited half will be bottled summer 2009. 8/26/08 Good carbonation already, even a bit of foam over. Flavor needs a bit of time to smooth out, but it shows promise. 6/28/09 Bottled the pluot half with 1/3 cup of cane sugar and a touch of Roeselare blend to aid in carbonation. The fruit had mostly broken down and lost its color. So you completely submerged the Flanders Red chair leg in the Better Bottle (it's sitting on the bottom of the bottle), and placed a new, unused, chair leg in the BB neck/stopper? It sounds like you have it exactly right. The old critter laden wood was actually so saturated with beer that it sank to the bottom of the Better Bottle on its own. After a year of soaking in the Flanders Red that wood doesn’t have much character left (the oak flavor is very mild in the Flanders Red), so I wanted to have some fresh oak flavor in the Pale. Rodenbach scrapes their oak barrels before new beer goes in, apparently they go deep enough to expose wood that still has some flavor and good oxygen permeability, but not far enough to get rid of the all the yeast/bacteria. i'm curious how the ale on the pluots came out? i've had a sour pale in a barrel for about 6 months and it is a little bland so i was thinking of putting it on some fruit to give it some complexity.